Is the daily cross you carry getting heavier? Then he said to the crowd, “If any of you wants to be my follower, you must turn from your selfish ways, take up your cross daily, and follow me. If you try to hang onto your life, you will lose it. But if you give up your life for my sake, you will save it. What does this mean? Each day offers us a new challenge and often a new sin. With all of the challenges and sins we face, we have a choice – which is to turn from our selfish ways. The choices we make determine whether or not we simply get splinters or wrench our back from the cross we bear. Our choices are made by how confident we are in our faith and how willing we are to turn from our own selfishness. But it boils down to a statement Phil Wilson, Lead Pastor of the Bridge Fellowship in Lebanon, Tennessee, said in a recent sermon: WE CAN CHOOSE OUR WAY OR GOD’S WAY. We often choose our way. 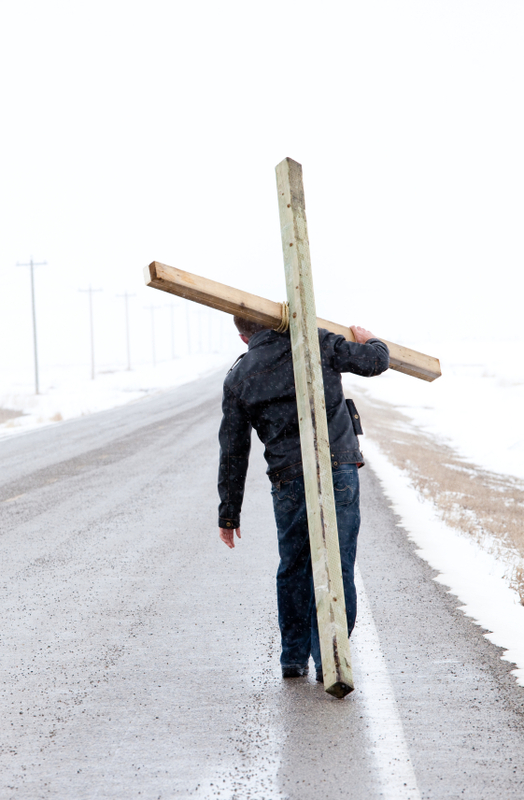 This is a heavy cross to carry – and a burden we put on ourselves. The irony is, it doesn’t have to be as heavy as we make it since Jesus has already carried the cross for us all that covers the burden of sin. You see, it was through his sacrifice, he was able to save us from the wickedness in our sinful hearts we are born with. This may sound a little “fire and brimstone” to the passive or new Christian. But the fact is, this is the crux of what we believe as Christians. We can’t escape sin. And we will always have a cross to bear – each and every day. But we do have a say in how much we have to carry. By turning away from our selfish ways to follow him, we redirect that weight back to Jesus who lifts us out of sin. We all have our daily crosses to carry. The question is, will you take up your cross daily and follow Jesus, or falter under the heavy burden of your sin? It’s our way or God’s way. Which way will it be for you? Really? God just spoke to me through a couch? I shouldn’t be surprised. I mean, God has been known to speak to people through some pretty odd venues, but a couch? Before you worry about me, this was not a burning bush experience. I did not actually hear a voice coming from my couch, so no need to call an intervention for me. God did, however, choose to use a very ordinary circumstance to teach me an extraordinary lesson. I’m beginning to see a pattern in how He chooses to speak to me. First overflowing toilets (story for a different day), and now a couch. I love that He visits me in the ordinary. It’s a very humbling experience. #1. Don’t miss out on a blessing because you are focusing on a negative in life. #2. Count your blessings and you will always find something to be exceedingly happy about. I kissed my children and went back to bed laughing at myself and loving my heavenly Father. Today: Don’t miss out on the gentle whisper of your Father. What is it He is trying to teach you? Why do we as Christians not allow one another to feel fear? On more than one occasion I have seen the chance to encourage one another with God’s Word be turned into a belittling session in God’s name over the issue of – FEAR. I’ve even been personally chastised over not having “enough faith” in God when I chose to be transparent and admit I was fearful or anxious about certain situations. These experiences have caused me to ask the question, “What is it that causes us to be real with God about every emotion besides fear?” We seem to believe that within each of us is some kind of “faith meter”. As if we could determine where someone stands with God based on how they are feeling. In my own experience, if I ever mention being fearful of a certain situation, my “meter” is assumed to be on empty. Fear is not the absence of faith; it is the human emotion that takes us to the throne room of God. What are you struggling with today? Are you afraid if you share your struggles, your faith will be seen as lacking? Be encouraged. God’s Word says we are to share one another’s burdens (Galatians 6:2). Let’s get real and begin to help one another through the various storms of life. Don’t hesitate another moment to find a friend and take your burdens to the throne room, knowing He is anxiously waiting to meet you there. Often, I’ll hear something I have to write down because it’s just that good. There’s some wisdom in those 16 words! When Christians are complacent, evil is allowed to run rampant and invade us like the flu bug. Our defenses are down and our immune system is low. The worst of it is that it’s something we choose. In a book I’m writing and hope to publish one day soon (ATTENTION: This is a first sneak-peek! ), I briefly discuss our noncommittal attitudes and actions when it comes to our Christianity and whether we are answering God’s call for our lives. I call this an “uncomfortable truth.” (This particular one is #4 of 5). If you recall the parable of the three servants, you may see where I’m going here. In Matthew 25:14-30, we learn about the three servants who were entrusted with their master’s talents while he was away on a trip. Each servant received different amounts as related to the scope of their abilities. Two of the three invested the talents and worked to increase them, garnering positive results. The third buried the talents keeping them safe, but not multiplying them. When the master came back, he surveyed the results, praising the two servants who built further wealth and gave them additional responsibilities. The third servant, well, he was not so lucky. He was described as a useless servant (Matt. 25:30 NLT). Is this not what we are when we commit to God by intention only? We are often no different than the third servant. He was a partial, useless servant. Our attitudes and actions need to reflect our commitments and beliefs. We can have the best intentions to do right by God and others, but unless we act, we allow the enemy to prevail. We need to be all-in! If we are a useless servant, we make it easy for evil to triumph because we are doing little to nothing to overcome it. Basking in the complacency of our Christianity falls way short of our spiritual potential. God asks more of us and, quite frankly, we should be delivering. And to be honest, I personally have some work to do.